TIme it takes to drive Old Ore Road? Re: TIme it takes to drive Old Ore Road? I just did the drive south to north last month. Total driving was about 3:30. We probably spent closer to five hours with stops. We were driving a 2WD F150 and hit hard at a couple places. Just got back. Drove from the south end to Roy's Peak Vista in 1.5 hours. From there the drive to the north end took another hour and 45 minutes. A safe driving time estimate is less than 3.5 hours. OOR is as rough as I've seen it in many years. So is River Road. 3:15 to 3:30 seems about right. I couldn't remember it being that bad but I also couldn't remember it being much better. Awesome, Al. Hard data, straight from the field. Looks like consensus is 3.5hrs, not counting stops. 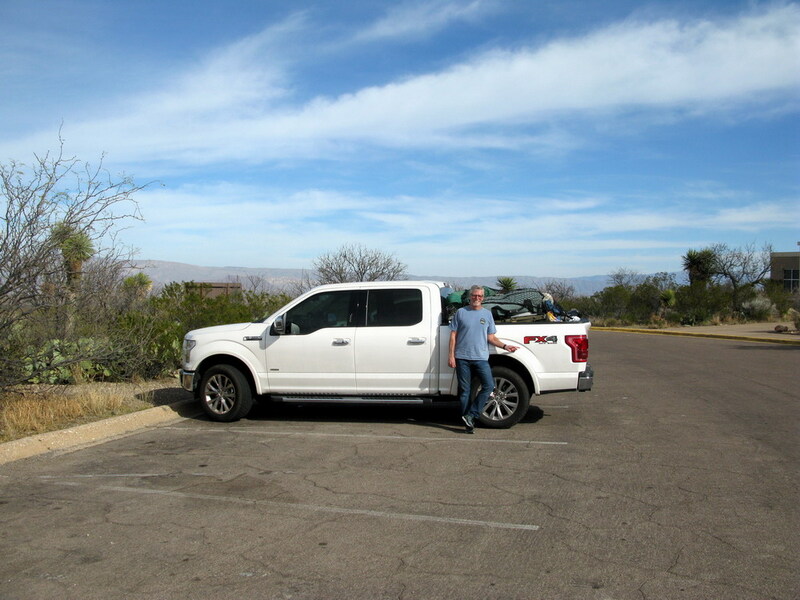 We were in a brand new F150 FX4 which is a competent high clearance 4 wheel drive. I have always driven it in a 2 wheel drive truck. We did engage the 4 wheel drive several times which is not to say you had to have it but it did help get up some rough stretches. By the time we got to Roy's Peak Vista I felt like I had been beaten up pretty good. I was glad we didn't do the whole run in a single drive. Would y'all say north to south would be a little quicker? Al, did you hit hard anywhere? We were getting ready to leave Roy's Peak and we noticed a dually with a large heavy self-contained camper shell coming from the south. We all looked at each other and said WOW this guy has some guts. A freaked out lady comes bursting into our camp waving a map. Usually this would have irritated me for disturbing the peace. But she was just too funny. She was totally freaked out. She couldn't believe someone had sent them down OOR with that big heavy camper shell mounted in their truck. They had stayed at Telephone Canyon the night before and were unsure of their directions We pointed them in the right direction and followed them out. There were stretches where the three kids and Mom would get out to reduce the weight of the truck so it could make it up the rough parts. We both stopped a the new fossil exhibit (Which is really nice and a must stop and see) and the husband told me she had prayed the whole way to pavement. They made it with minimal apparent damage to the truck and camper but following them out there were times that I wondered if the truck was going to tip over sideways since it had such a high center of balance. This is the only time I can recall a ranger providing less than conservative advise. They were staying at Gravel Pit that night and having just come down River Rd a couple of days before, I was able to assure them that it would be a comparatively easy drive. Lol. Wow. I met a fellow from Germany a couple years ago with a similar rig at Ernst. I assumed he came from the south. He said his rig had the tanks at the bottom to lower the center of gravity. He also popped up with a couple feet of canvas. Again to help the off road capabilities. Al- we were at the other TC campsite and saw the camper on the way out and had the same thoughts. Saw them again at the fossil exhibit and Mule Ears saw your truck and said he bet it was yours. It took us about 1 and a half hours to get to the site from the south in my old Ford F-150 (14 miles). Btw, the road on the drive in to Ernst is a piece of cake compared to the remaining drive to TC. Damn! I knew it was Al's truck and should have started asking around if Al was here! Probably my only chance to actually meet one of my BBC heros. And yes being my first time on the OOR, I thought the southern half seemed particularly rough from other reports and pictures that I had seen. We bent one of his running boards on Black Gap otherwise it was pretty much unscathed. It was the packing job and the propane heater that tipped me off but I didn't spot the heater until we were driving out. It was the pack and the propane heater that tipped me off but I didn't spot the heater until we were driving out. I couldn't believe how warm it was in early February. We did use the infrared heater but only one burner on low. Sorry I missed you guys. Hopefully there will be a next time. Can't wait for your trip report!